Let's face it ... so many wedding photos just plain look the same! Why would you want the same photos as all of your friends? No matter how many times we are at The Garrison to photograph weddings, we make sure each wedding has its own look. We also ensure each couple gets a signature piece of art that is all their own. This couple had so much trust in us. When we asked them to sit down next to the rather ordinary-looking branch sticking out of the ground, they happily sat. In a field full of mature trees and gorgeous views, we just knew this was the branch we wanted. This unlikely location combined with warm sunlight made for a compelling piece of art. 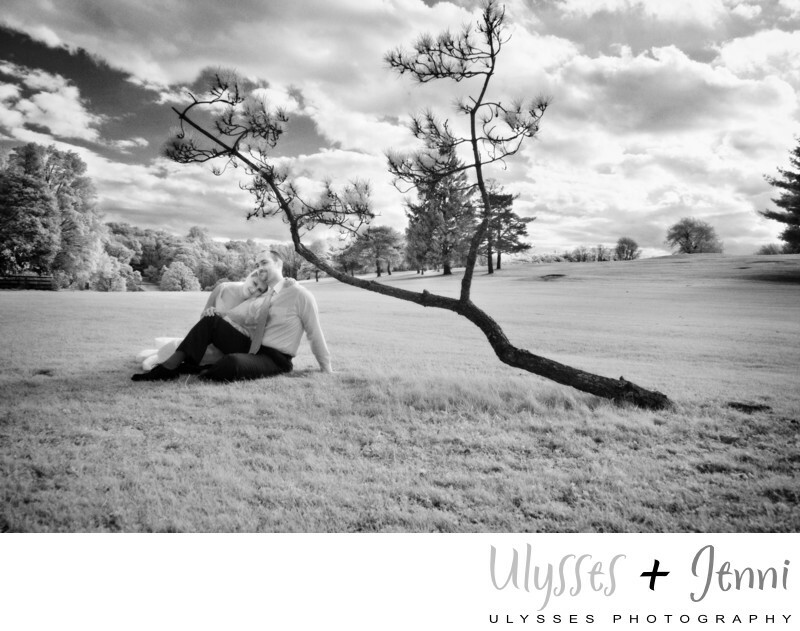 I love how the lines of the branch form leading lines straight to the couple. This frame was also taken using a special infrared camera. Ulysses has specialized in infrared photography for the past 15 years, and is a true master of this form of photography. We love its slightly surreal, always fascinating appeal. Location: 2015 Route 9, Garrison, NY 10524. Keywords: Cape (6), Cod (6), Garrison (12), Kylie (9), Scott (9), wedding (528).